Our clients have graciously allowed us into their homes to share their new countertop experience with Progressive Countertop: from choosing their design, to installation, to showing off their kitchen transformations. Let their stories and photos inspire your next project! Progressive Countertop’s very own Danielle Heath designed this kitchen as a student of Fanshawe College’s Interior Decorator program. We are so proud to show off the design that earned her a top-10 spot in the 2017 Student Kitchen Design Competition, sponsored by the Ontario Chapter of the National Kitchen and Bath Association. 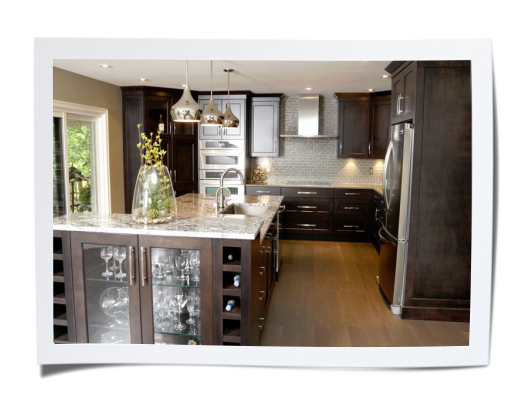 From the Ground Up – with Granite! Ann decided it was time for a change after her 19-year-old home was damaged beyond repair in a house fire. An unfortunate circumstance brought Ann a new opportunity – the chance to design her dream kitchen. Ann’s natural granite countertops not only look amazing but provide durability and resilience – both must-have features in any busy kitchen. This couple undertook a full renovation of their new, 25-year old home in London, Ontario. By starting from scratch they were able to get the kitchen of their dreams and combine Lennox Granite and Coarse Pepper Quartz to create a look you will love. This couple wanted to create a soothing, cottage-like feel in their kitchen and neutralize the gold tones in their natural maple cabinets. By combining a Hanstone® Quartz counter in Sand Dune™ on the workspace paired with a Fantasy Brown Granite lunch counter, they created the lake-side look they were going for! With two young children, you might think that an all-white kitchen, complete with a quartz island countertop (resembling white marble), would be, well, risky! Coralie and Shawn show us how modern design and durability make for a winning ‘life-and-style’ combination! When Alicia & Ben came to us, they had one goal in mind: to renew their 17-year-old home and bring out the natural light. See how the beautiful pattern in Sienna Bordeaux Granite adds movement and warmth, picks up on natural light and invites you into their kitchen! Mike & Julie wanted to add unique finishing touches to their brand new home. With a cream and black colour scheme in mind, find out why they chose Silver Supreme granite — it’s part of an impressive kitchen island centrepiece. 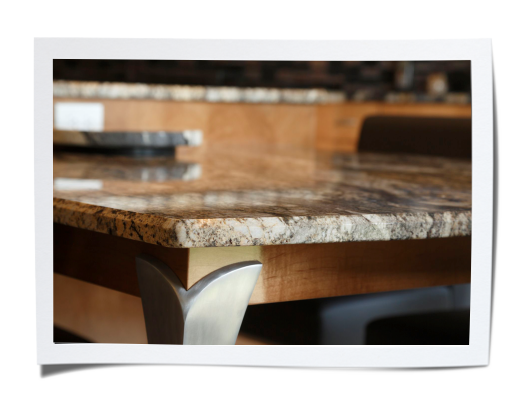 It’s amazing how much a new granite or quartz counter top can change the look of a room! Whether the counter top is part of a kitchen renovation, a makeover, or a new home installation we find it very rewarding to help our clients achieve their design ideas, or solve their design dilemmas! – We will help you find Your Color, Your Cut, Your Style!